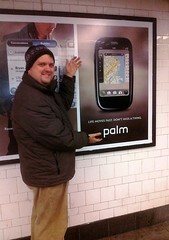 If you've not seen my Twitter feed, you may not know that on Monday, I'm returning to a position with Palm. I'm heading back to be part of their Developer Relations group, reporting into the dynamic team of Ben and Dion of ajaxian fame that Palm brought in last summer to shake things up with webOS. It was a hard decision to leave Mozilla; they've been very good to me over the last year, and I feel pretty happy about the 1.0 release of Firefox for Maemo (aka Fennec) that came out in January. I'll miss the fun chats on IRC and the visits to their offices in Toronto and Mountain View. However, in the last year I found that my real passion lies in communication and teaching. I'd had a blast with my classes at NYC Resistor, and I've loved working with developers in past positions at Metrowerks, PalmSource, and Palm. Being the expert in an online forum suits me very well. With that background, I'm looking forward to evangelizing the webOS platform, and I hope that I'll be able to assist some people in writing great native apps and plugins on the Palm Pre and Pixi phones. Wish me luck! I'll be posting details on my new Palm webOS developer blog as soon as it is ready to go. Congratulations and good luck! I really like my Palm Pre and I hope to see it do well in the future. I bought that the day it came out!